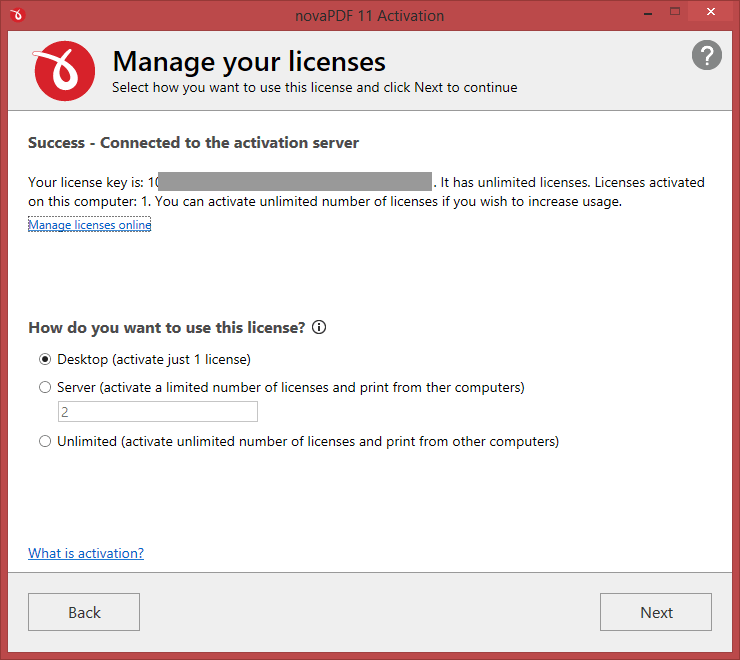 After purchasing a license for novaPDF you have to activate it. Activation allows verifying that your copy is genuine and that it hasn't been used on more computers than the number of licenses purchased. It prevents this way software counterfeiting (intentional or unintentional). After you purchase a license you will receive an email with your licensing information. Using the license key received via email you can easily activate novaPDF automatically if your computer is connected to the Internet. During the activation process your license key is verified online and after it is detected as valid you can start using novaPDF. Open novaPDF. The novaPDF Activation window will appear and you need to press Enter Key button (slightly different window shows when the trial expires too). 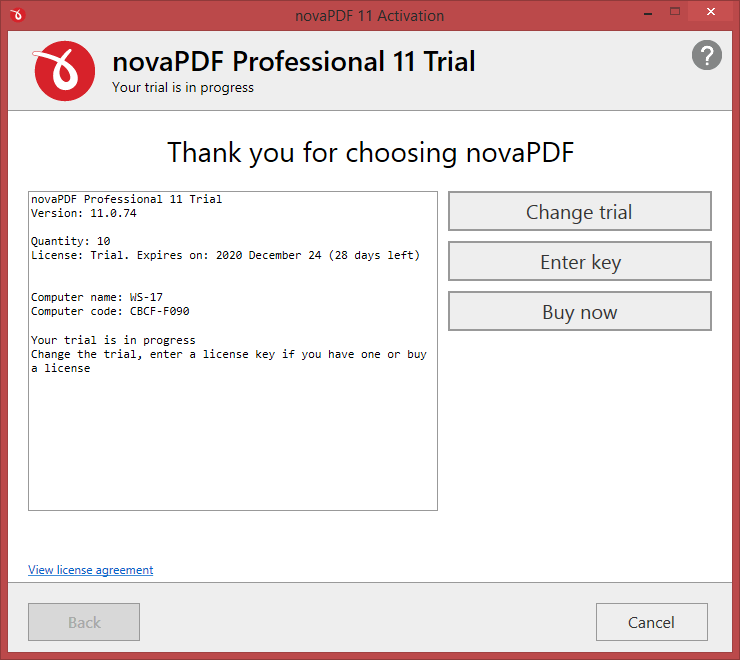 If you are still using the trial version, you'll need to open the novaPDF Activation window. 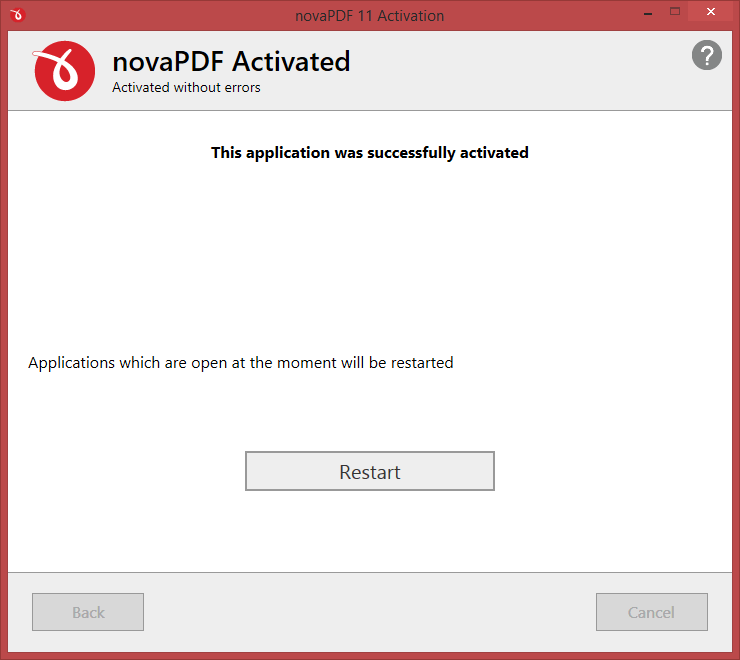 Go to Start and type in novaPDF Printer Manager. 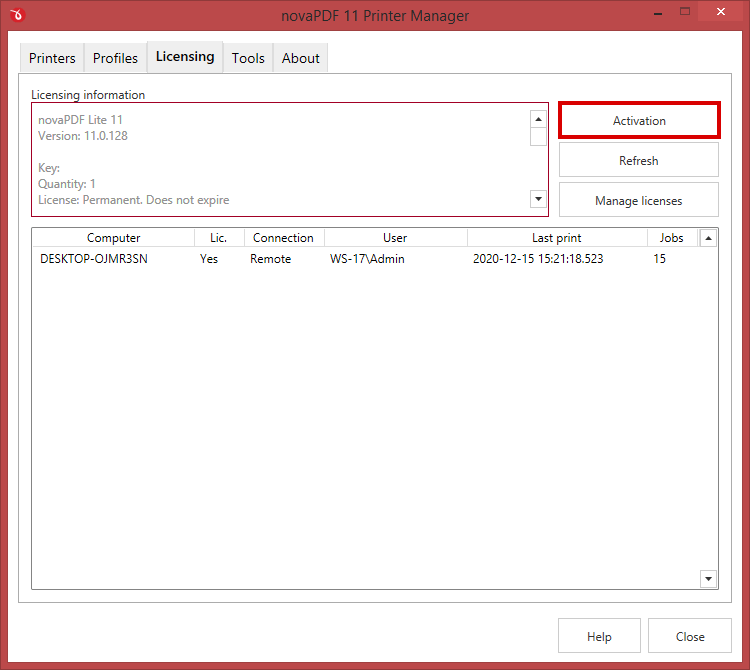 Once that window is opened, go to Licensing and click on Activation from the window that opens. In the Activation window, you need to enter the Product key received by email after purchasing novaPDF. You can also choose to activate using the .lic license file that was attached to that email. Add the other mandatory information you want the product licensed under (i.e. First/Last name, Company name, Email). If you purchased just a single license leave the Quantity field as it is (value 1). However, if you purchased several licenses and want to activate all of them on the current computer, enter here the amount you want activated (has to be lower than or equal to the quantity you have purchased). Optionally you can add Comments, these will show up under the activation details in your online account. Press the Activate button to finish activating the application. Note: If you are connecting through a proxy to access the Internet, you'll need to click on Proxy settings to enter your connection details. A message will be shown that the application was activated.